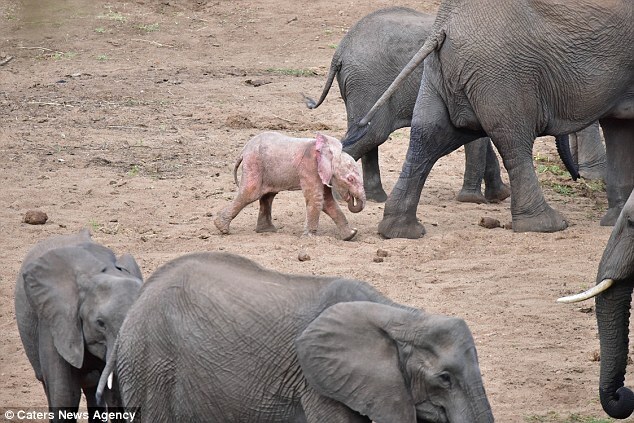 Looking at these photos, you would be excused for thinking that you have had one too many, but this really is a pink elephant. 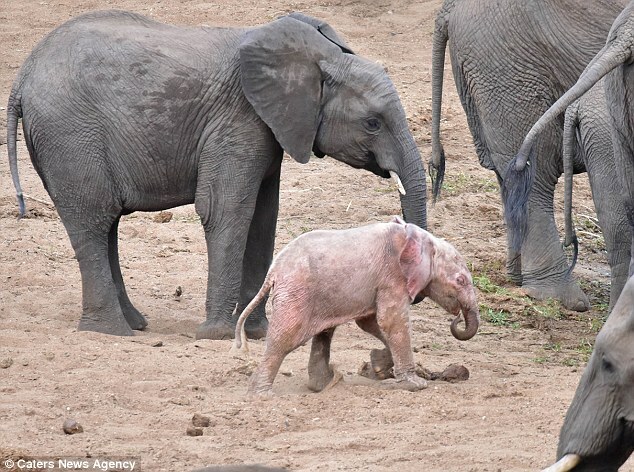 The baby albino elephant was spotted in a herd in the Kruger National Park in South Africa, as it went to drink from a river with its mother. Albino African elephants are an extremely rare phenomenon – even more so than among their smaller Asian cousins. 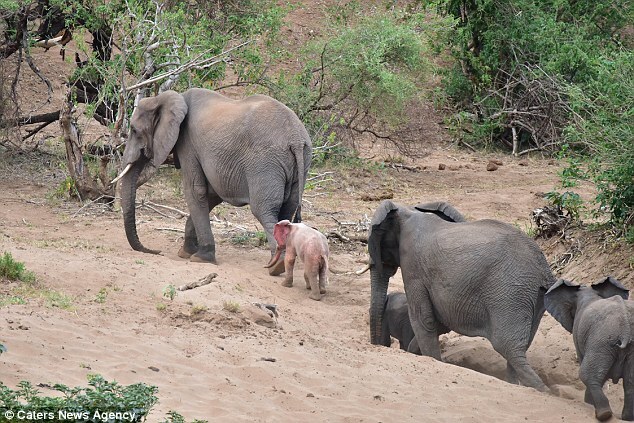 The little albino calf is set to face many risks, despite being in a fairly safe environment of the national park, which may help protect it from poachers. The lack of pigment in its skin is likely to cause skin problems due to exposure to the blazing African sun. As with in albinism in humans and other animals, is may suffer blindness later in life as its eyes are sensitive to sunlight. 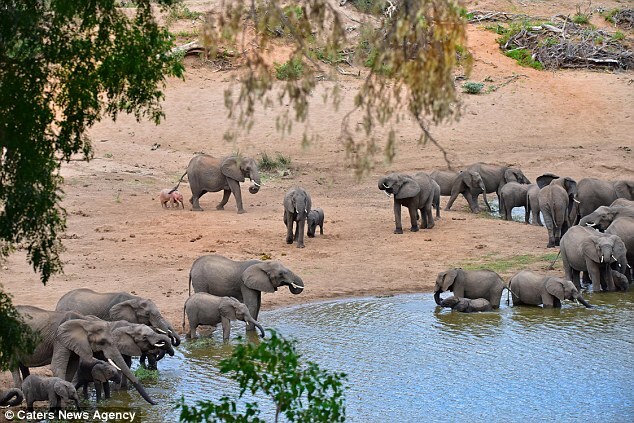 The rare sighting was made by tourist Nicki Coertze, 58, while on safari with his family in Shingwedzi. 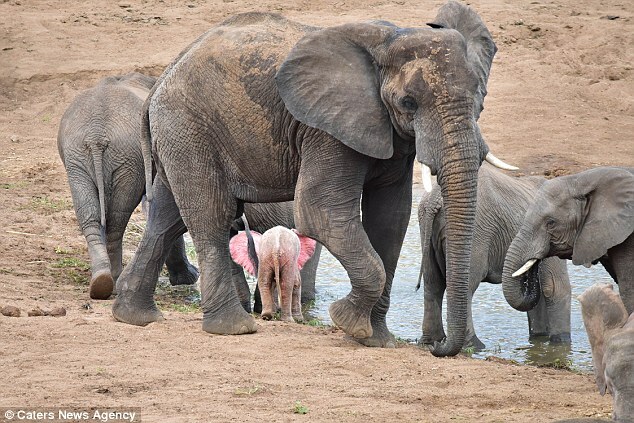 Mr Coertze, from Polokwane, South Africa, said: ‘We were watching the elephants drinking at the Shingwedsi River when we noticed the albino elephant calf. ‘We took pictures of the elephant through the car window, I was trying to keep super still in spite of the excitement of the others in the car. ‘I was really hoping the pink elephant would play in the water a bit, and wash all the dirt off, so we could see him in all his pinkness. 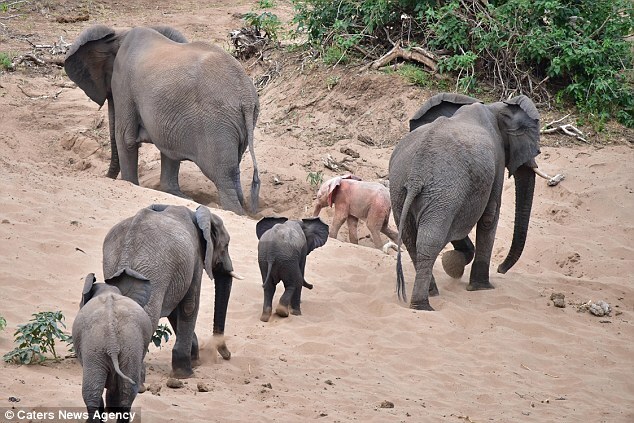 ‘I took some lovely shots of the pink elephant. Some of the shots show it framed by the legs of another elephant, you can really see the contrast in colour between the two as the calf shows off its unique pinkness beautifully. ‘I have been visiting Kruger since my early childhood, and have over the last many years being spending at least 20 to 30 days in Kruger every year. ‘I have never seen an albino elephant before. ‘And then, none of my many friends have either. So bearing that in mind, I have an idea that this is a once in a lifetime sighting for me.